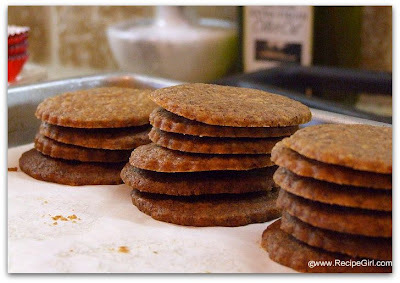 The cookies themselves are a simple shortbread cut-out cookie flavored with powdered espresso. Cut them into whatever shapes you like. For dipping, it's good to find shapes that are symmetrical, like circles, Christmas trees, hearts, diamonds, etc. 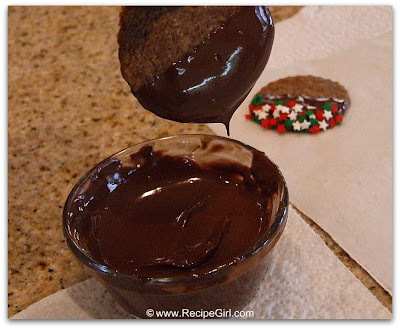 These cookies are dipped into melted chocolate. I edged them with some cute Christmas sprinkles to make them more holiday-ish. Left on the counter for a couple of hours, the chocolate sets up nicely. I popped these into the freezer in a covered container between layers of waxed paper. 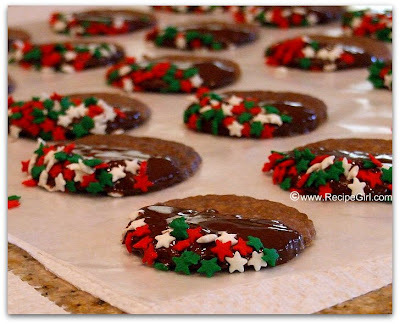 Good for freezing... either freeze the shortbread itself ahead of time and dip later, or dip- let set- then freeze. These were delicious! The espresso-flavored shortbread was tasty, and dipping them in the chocolate was a nice addition.